You own the best Cable Tester in the world. Make sure that it is up-to-date and that it is within specification. 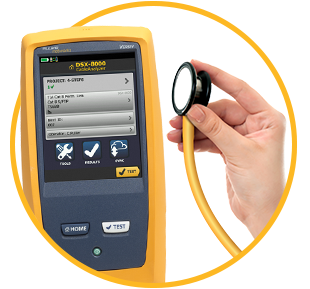 A Fluke Networks Service Engineer will execute a health check of your DSX to test if your instrument is operating correctly, clean the case, assess the firmware level loaded in your tester and if needed, update it to latest firmware revision, all free-of-charge. While you’re waiting for the Service Engineer to complete the above-mentioned activities you are invited to attend a 1.5-hour presentation in which a Fluke Networks expert will discuss the latest developments in the area of cabling infrastructure certification. A health check of your DSX to test if your instrument is operating correctly. You will receive a printed health check report and your DSX will be cleaned and updated to the latest firmware. Learn about the significance of a factory calibration executed at the manufacturer specified intervals and the correct method of performing a calibration to ensure expected accuracy levels are met. Get exposed to the latest developments in the cabling infrastructure standards. A Fluke Networks expert will present and demonstrate you the new LinkWare Live SaaS (Software-as-a- Service) and you will be assisted in setting up your free account credentials or coached on how to best use the SaaS. Examples of the latest Versiv options, enhancements and accessories will be available for review and can be seen working during the session. Warning: don't register multiple people using the same email address.